This is the second recipe in the Tabasco 10 Ingredient Challenge. Each day this week, I will be posting a recipe, where I could only use any combination of just ten ingredients. See those ingredients and read more about the challenge here in the first post. 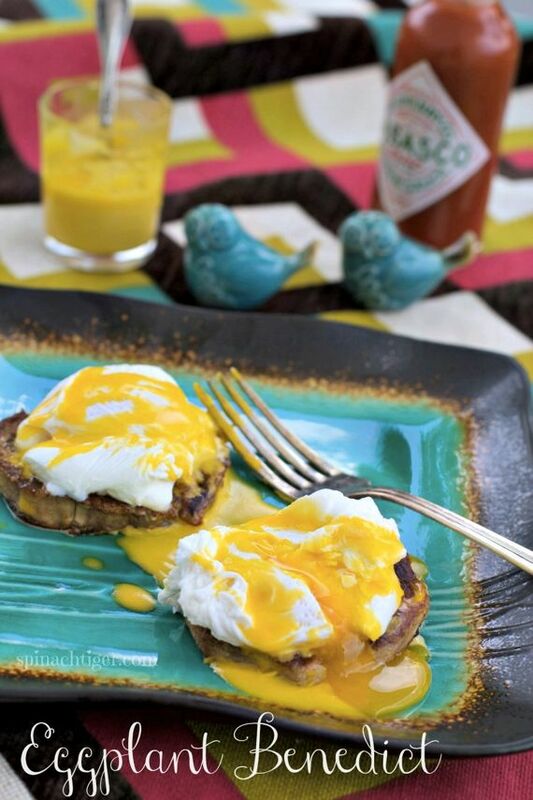 Eggplant Benedict with Tabasco Olive Oil Hollandaise is not only zesty, creamy, spicy and comforting, it’s Paleo friendly. I replaced the English muffin with fried eggplant that is not breaded. Breading the eggplant is an option, but for this recipe I wanted to go grain free. Before I get into the recipe I want to take a minute to thank my best friend for the cute blue salt and pepper shakers in the foreground of this picture. I know she reads every post (thanks for that loyalty). She said, “just a small gift,” but it was the big thought. I love anything blue, kitchen or owls, even thought I’m not one of those collector types. Who knew they would be so adorable in the picture. It reminds me of how much a small thought can count. I only used two ingredients for this dish. Eggs and Eggplant. Oil is allowed and Tabasco is of course, in every recipe. Tabasco has always been on my breakfast table to spruce up egg dishes, and it’s a natural in the Hollandaise sauce. The only tricky part of this recipe is the eggplant. I dipped it in egg before I fried it. No bread crumbs. This means you must salt the eggplant for at least one hour to draw out moisture. If you don’t do this, the eggplant will soak up too much oil and not get golden brown and crispy. I wanted Hollandaise for this but couldn’t use lemon, lime or butter as I did in this lime Hollandaise recipe. No problem. The acid in the Tabasco gave the Hollandaise it’s zestiness and I used warmed olive oil instead of melted butter. It was creamy, rich and oh so good. I love eggs made just about every way. You can find recipes for perfect poached eggs here and oven fried sunny side up eggs (with video) here. Paleo Friendly Eggs Benedict. Olive oil Tabasco Hollandaise Sauce atop perfect poached eggs and eggplant instead of bread. Heat olive oil in frying pan and fry eggplant until golden brown. Warm olive oil over a double boiler. Trickle the olive oil into the egg mixture while on very low speed. Return the mixture to the double boiler and whisk over low simmering water until the sauce is the consistency you want. 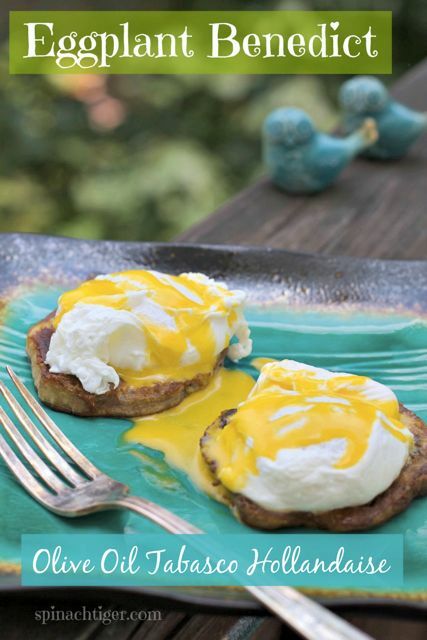 Top each eggplant disc with a poached egg and hollandaise sauce. The link to the poached eggs recipie is broken. It’s missing the colon between “https” and “//spinachtiger.com”. Such a smart idea to swap out the bread for eggplant slices! Nice Angela! I have in fact ten bottles of various Tabasco flavors here waiting to be used! Well in all fairness, they are being used daily but they do go a long way. This looks delicious! This is such a fantastic idea! Good tip about salting the eggplant, too. Yum! Thanks Ashley, yes I learned the hard way about salting the eggplant. brilliant! this sounds so good! Oh So glad you like it. Grain free!